Do all of your business processes start on time? It's a good question, one that we sometimes forget to ask. If you want your processes to deliver on time, then starting on time is one of the best (and simplest) strategies that you can deploy. What influence do you have on your processes, to help them start on time? Do you know what has to happen in order for your process to start when it should? Do you actively manage your 'suppliers' (both the external ones and the internal ones) to help ensure that your process can start on time? Do you have access to enough information in order to truly manage your process from end to end, in a timely manner? There are so many businesses whose managers face problems because their processes don't start on time. These same managers also have a degree of control that they don't exert in order to improve the on time start of their processes. Could this change in your business? ...basically there are enough reasons to take a time out to ponder the questions I have raised in this blog post. Business life can be complicated, and have a lot going on at times, but the fundamentals of running a process can be relatively straightforward when you look at it from a 'cause and effect' perspective. I hope that you can find a few insights about your own business from answering the above questions. 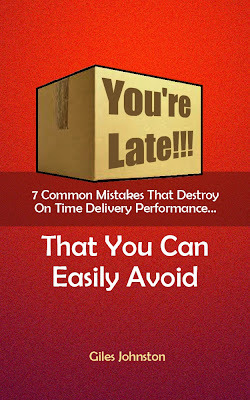 If you would like some additional ideas on improving the on time delivery performance of your business then don't forget that you can download my free on time improvement guide when you sign up to my monthly update.